Let’s start with the positive aspects of this new interface. It’s responsive and integrates really well into the OneDrive app for mobile devices. However there are currently a number of setbacks for users when switching to the new look interface. Users should consider it carefully before turning the new interface on at tenancy level or on a per user basis. A while ago I blogged about using JS instead of custom master pages to brand the look and feel. Again this is client side code and was Microsoft best practice, however this doesn’t seem to apply to the new view. The new look interface despite being modern and minimalist is bland and unbranded. Most companies/schools want branded intranets, they are always keen to get away from the “SharePoint” look. Although the new interface is modern and responsive, all of the pages look the same and it is possible that we will fall into the trap of looking like SharePoint again. Theming engines do not offer the bespoke customisation that most users require. The future of SharePoint event and videos did mention a chrome as part of the SharePoint framework so we can only hope that this is exposed to JS developers. On occasions users require a link to a document or image inside a library. This used to be easy for users to do, open it up and copy the URL. This is no longer possible for an image library as each image opens up in a lightbox view. There are no options to get a link to the exact image, in fact there is an option called “get a link” but this shares the image and changes the permissions rather than giving a URL link (for users to use on a site or email). These are the initial issues I have found with the new look interface. It seems to be have been rushed out to tenancies without investigation into how customers use library views within SharePoint. 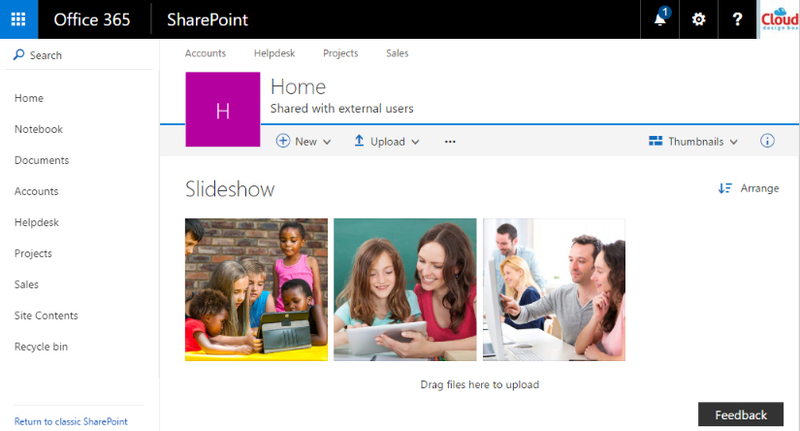 Although there is a benefit having a similar interface to OneDrive and having it work as a single page application, the fact that it is part of a SharePoint site and has that extra SharePoint functionality makes it usable to end users. The new views will run side by side until 2017, hopefully by then Microsoft will have resolved the issues and released the new SharePoint framework for Microsoft partners (due to go live in autumn 2016) to get developing branding and custom JS solutions. 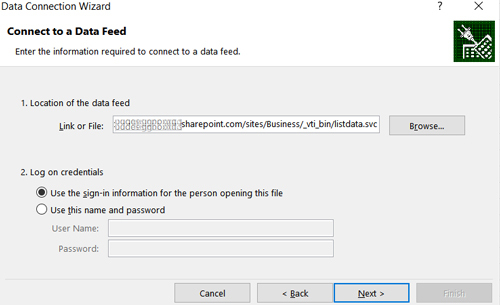 List data inside SharePoint can be pulled into Excel as a data source which can in turn be embedded on a SharePoint page as a graphical representation of the SharePoint list data. 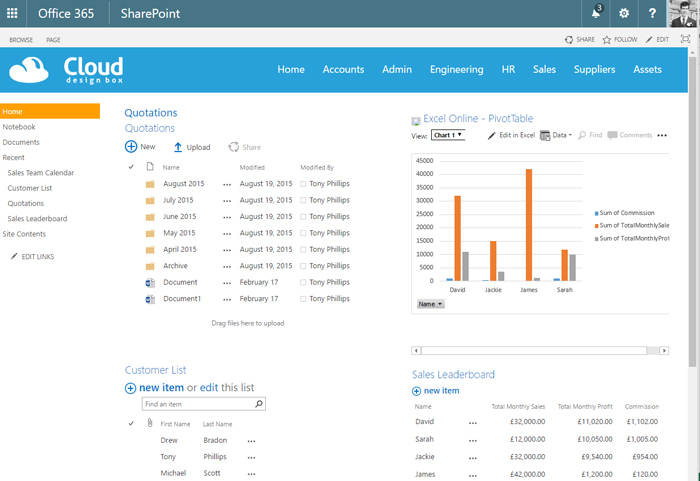 Great way to spice up your SharePoint page with graphical content and the functionality is built into SharePoint online. It’s also available in SharePoint on-premises 2010, 2013 and 2016 if you have Office Web Apps configured or excel services enabled. 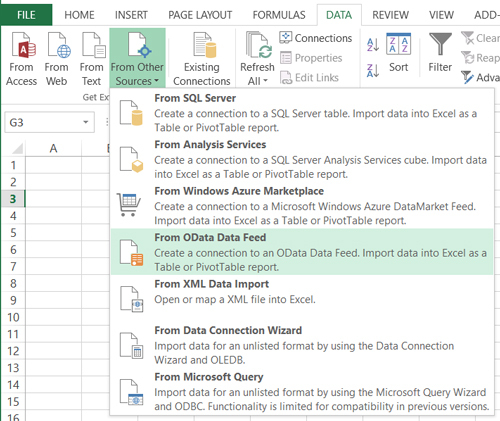 First open excel and go to “Data” in the ribbon and “From other sources”, select “From OData Data Feed”. Copy and paste the URL of the site adding “_vti_bin/listdata.svc” at the end. Select your list when prompted and a pivot table will appear. Select a few columns to populate it with data. Save the excel file and upload it into a SharePoint document library on your site. 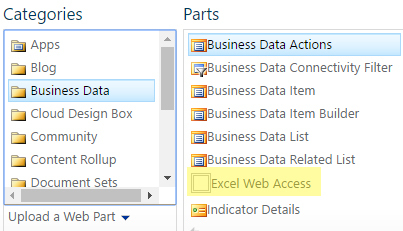 Edit the page and add the “Excel Web Access” web part under the business data category. 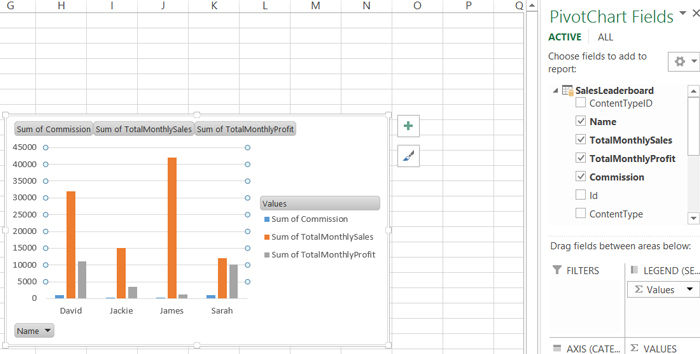 In the web part properties select the excel document and optionally enter a named item such as a pivot chart or table. Your chart is now on the SharePoint page and can be configured to refresh at intervals. It’s a great way to visualise SharePoint list data easily without any third party products. Watch the video guide below for a more detailed explanation and guide. This entry was posted in Excel Web Access, Office 365, SharePoint 2013, SharePoint 2016, SharePoint News, SharePoint Online, SharePoint Online Permissions, Tony Phillips and tagged charts, Cloud Design Box, Codnor, Derby, Derbyshire, Design, excel pivot chart, graphs, graphs on sharepoint page, Hull, Nottingham, Office 365, Office Online, Office Web Apps, pivot, pivot chart, SharePoint, SharePoint 2010, SharePoint 2013, SharePoint Consultancy, sharepoint list data chart, sharepoint list data graph, SharePoint Office Web Apps, SharePoint Online, SharePoint Tony, Tony is here, Tony Phillips, tony phillips derby, Tony Phillips SharePoint on June 3, 2016 by Tony Phillips.